Would Elizabeth Zimmermann be proud of me? I’ve completed my buttonhole research for Level Two of the Master Hand Knitting Program and my brain is on buttonhole overload right now. Something tells me Elizabeth would be sighing, shaking her head and telling me just to chill out about my ‘pigseyes’ but I don’t think the TKGA Committee would have the same reaction. Instead, I suspect I will have to resubmit some of these swatches but, nonetheless, I am still thankful for this buttonhole journey. I will feel a little more confident the next time I encounter a buttonhole. I won’t be knitting ‘pigseyes’ anymore! There are many different buttonhole designs and believe me, I experimented with just about all of them. Some of them looked a whole lot better in one fabric than another so I can see that this is an essential skill to have. I have knit my horizontal, vertical and eyelet buttonholes in single rib, double rib and seed stitch. 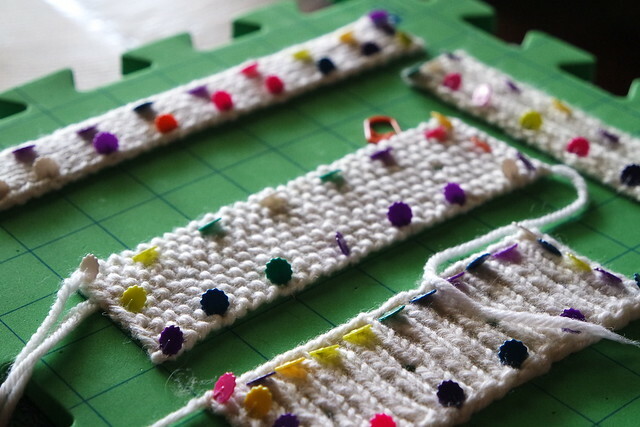 I have figured out how to space buttonholes on a band given a certain number of stitches – not only horizontally but also with a 1″ of knitting above and below each buttonhole – whew….took forever. The final swatches are on the blocking mat as I type and tonight I will weave in the tails. Tomorrow will be their photoshoot for we are now to keep a photo record of everything we submit to the TKGA Committee. 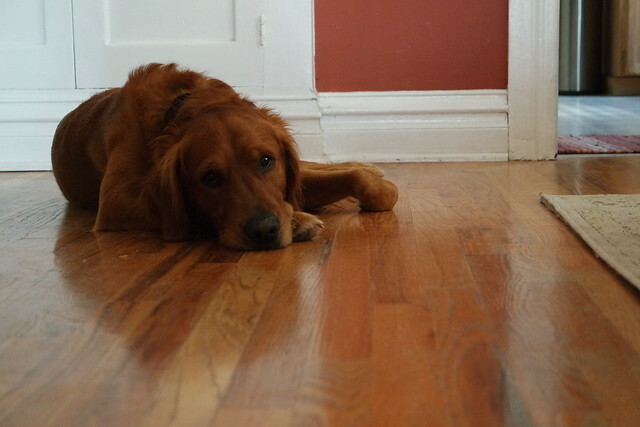 I’m in Denver this week because I am grandma to my daughter’s golden retriever. While I am sweltering down here in the Mile High City she is up in the cool mountains at a nurses retreat. It is hot today and there is no air-conditioning so the pooches are pretty lethargic which makes for good research time. 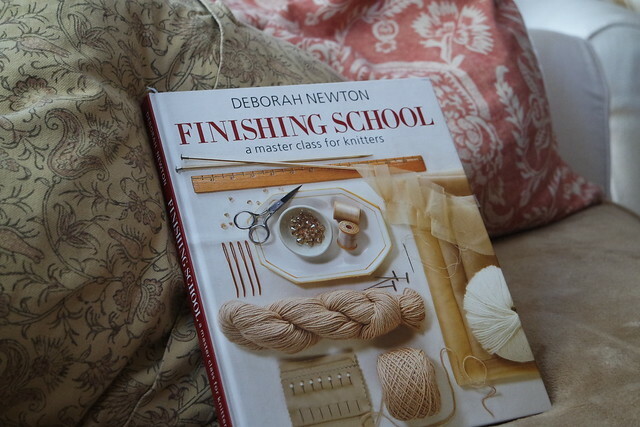 This afternoon I will be writing my second book report, four required, on Deborah Newton’s Finishing School – A Master Class for Knitters. This book has proven to be a valuable resource for all the seaming swatches I had to do. I’m hoping it will live up to its reputation when I research the next swatch, picking up stitches. 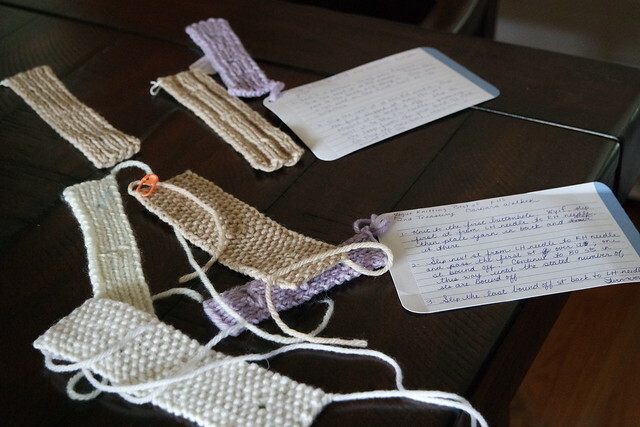 I’m used to picking up stitches along gusset edges on socks but Swatch 18 will be simulating a scooped neckline. It will test my ability to select appropriate decreases for a neckline, accurately pick up stitches along bound-off selvedge edges and calculate an accurate ratio for picking up stitches along a selvedge edge. 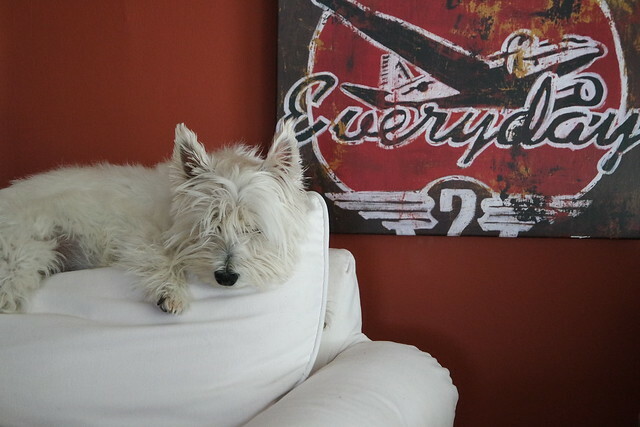 Hmmmm…..Maybe I want to take a nap on the couch instead. 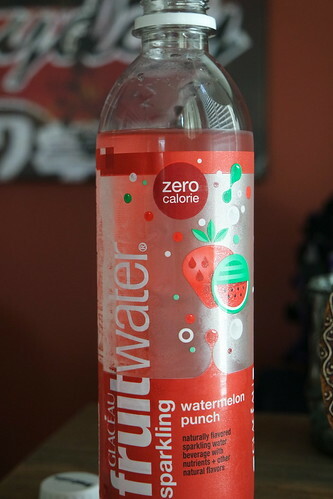 I’m staying hydrated! This entry was posted in Knitting, Master Knitting Program by socksformum. Bookmark the permalink.